[Updated Aug 2015] Went to Crown Bakery for some Hainanese Chicken Rice Bread breakfast, and found a SG50 Brioche ($2.50) – decorated with a crescent and five stars. 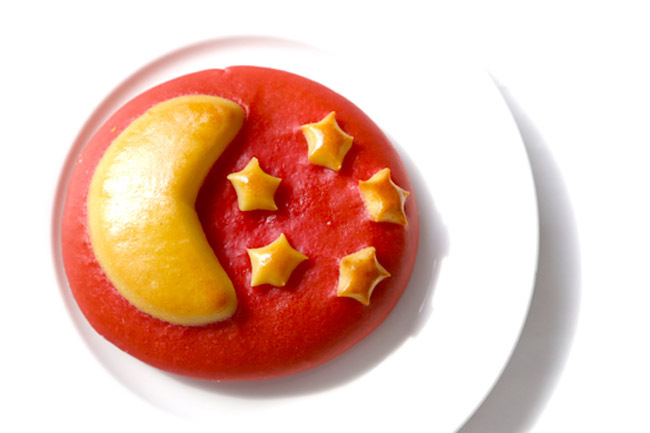 The pinkish-reddish colour came from beetroot juice, while the other ingredients included Japanese wheat flour, natural leaven, French butter, almond putter, eggs, sugar and sea salt. Soft and fluffy, and a tinge of sweetness. No artificial colouring or flavourings used. If there was some sort of fillings, this would be the perfect bread for me. Well, some may argue about using the Singapore flag on a bread (How can?! ), but let’s have some room for creativity. Get the SG50 bake while it lasts. [Original Entry] One Ring to rule them all, One Crown to fill our stomach with soul satisfying bread. 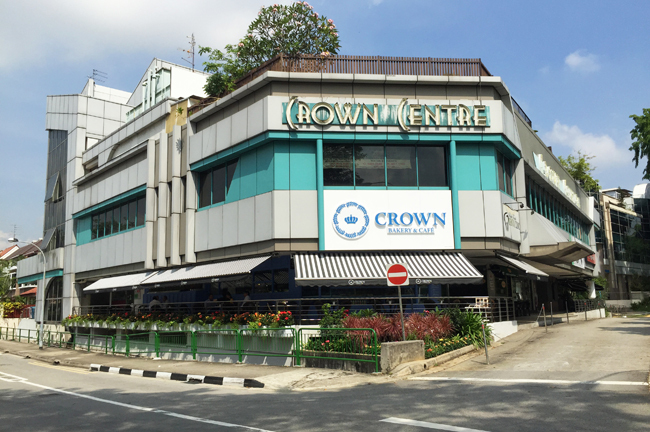 Located at Crown Centre along Bukit Timah Road, Crown Bakery & Cafe serves artisanal breads without the use of artificial food flavouring, colouring and preservatives. The florist opens a bakery. 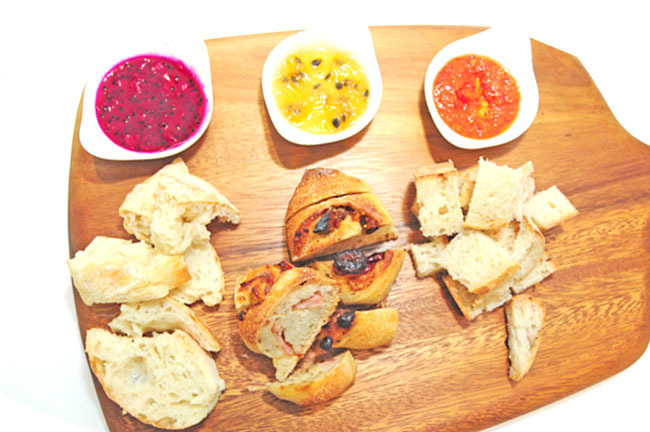 Ah huh, popular Far East Flora collaborates with Japan’s Signifant Signifé to offer more than 40 types of bread, viennoiseries & snacks, committed to craft bread that is fit for royalty, for everyone. Head Baker Kevin Chang, who had 17 years of baking experience in Singapore, United States and Taiwan, heads the Bakery. 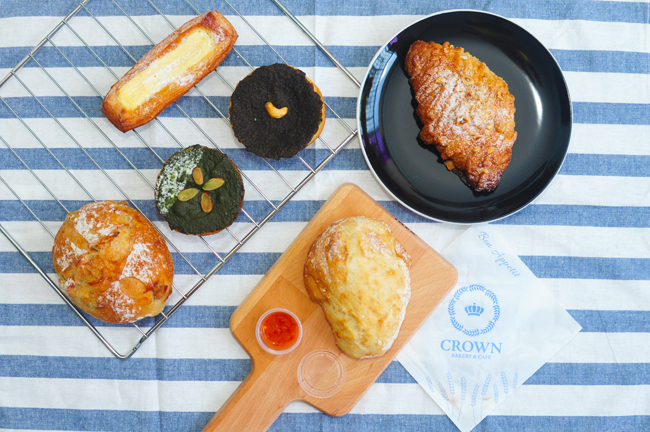 Under the guidance of Master Baker Katsuei Shiga who had more than 40 years of baking experience from Signifiant Signifié, Japan’s top- notch artisanal bakery, Crown Bakery offers a fusion of Japanese’s baking expertise and European- styled breads. More than just a bakery that offers artisanal breads, coffee from Brewer’s and tea from Allerines, they offered brunch items such as Crown Breakfast ($29), The Queen’s Eggs Ben ($18) and Earl Pear Bread Pudding ($18). 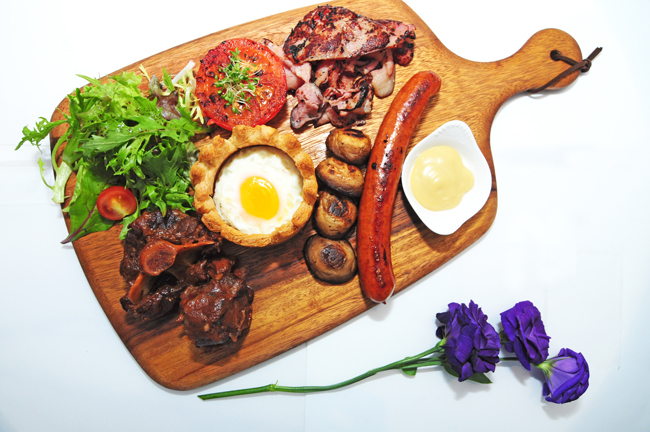 The Crown Breakfast came on a huge chopping board with different kind of meats such as red wine- braised oxtail, chicken sausage and Canadian back bacon. The centre piece with the crown attracted the most attention, in this case, the Crown Puff Pastry that was really crispy to touch. Among the meat on the platter, we loved the red wine braised oxtail most, being well braised, tender and easily detachable. 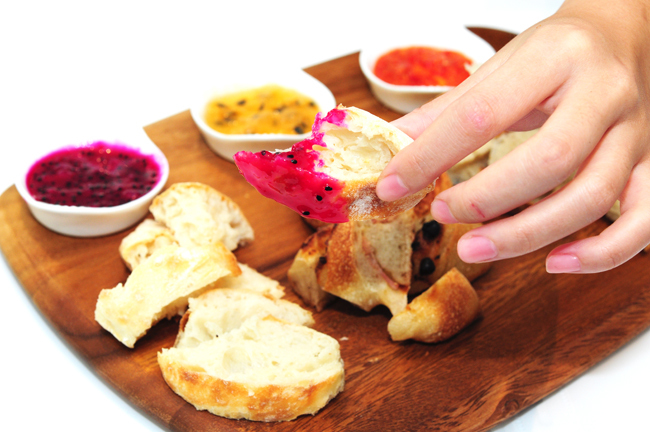 Crown’s Signatures comprised of the Crown Bread ($12.80) shaped like a laurel that comes in 4 flavours – mustard & chocolate, cranberry & cherry, bacon cheese and red wine fig. It was addictive. Before we knew it, we cleared the plate of these bite sized bread after the same repeated action of popping it into our mouths. Our personal favourite was the innovative local rendition, Hainanese Chicken Bread ($4.50). It was made from chicken soup, skinless chicken thigh, garlic, ginger and shallots. And not forgetting to dip it into the chicken rice chilli sauce, which was one of the key players in a successful plate of chicken rice. Imagine the aromatic smell of chicken rice drifting right in front of your nose, only to realize that it’s a loaf of bread instead of that plate of glistening chicken skin and white tender chicken meat. My makan kakis loved this Hainanese Chicken Bread. Normally, they will order 鸡饭不要鸡，虾面不要虾 (chicken rice without chicken, prawn mee without prawns) and this got their stamp of approval. Amongst the artisanal bread, we loved aromatic tea leaves scent of the Shizuoka Matcha Brioche ($3.20) and Earl Grey Cashew Brioche ($3). 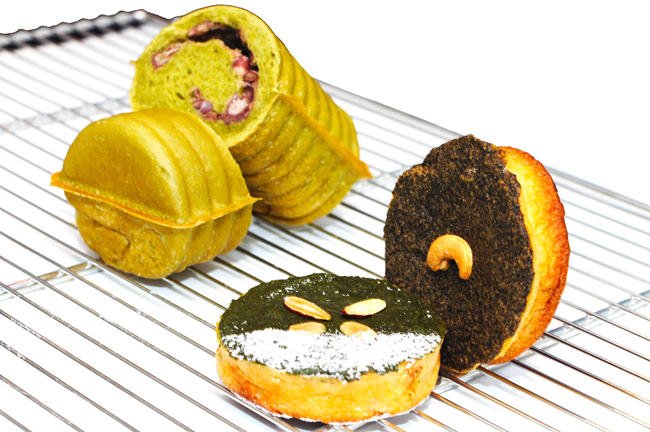 The bricohes were soft, fluffy and moist with distinct and non overpowering matcha and earl grey taste. We are excited about the idea of fusion between Japanese’s baking expertise and European’s baking heritage, European bakes with an Asian touch, and an agglomeration of like- minded local products to provide chemical-free food to everyone. 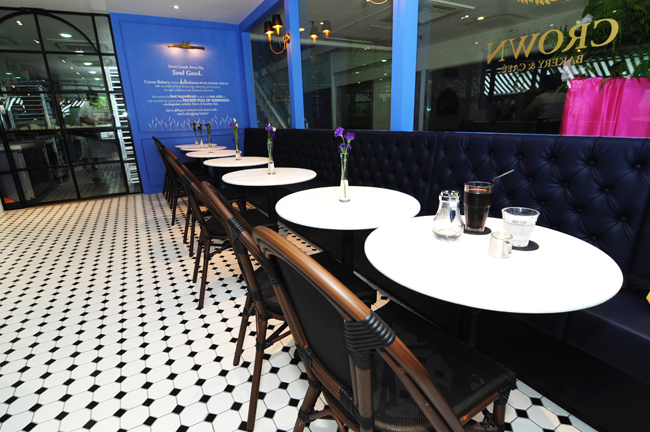 * Written by Daniel’s Food Diary Café correspondent Nicholas Tan @stormscape who is always on a lookout for [NEW] places.